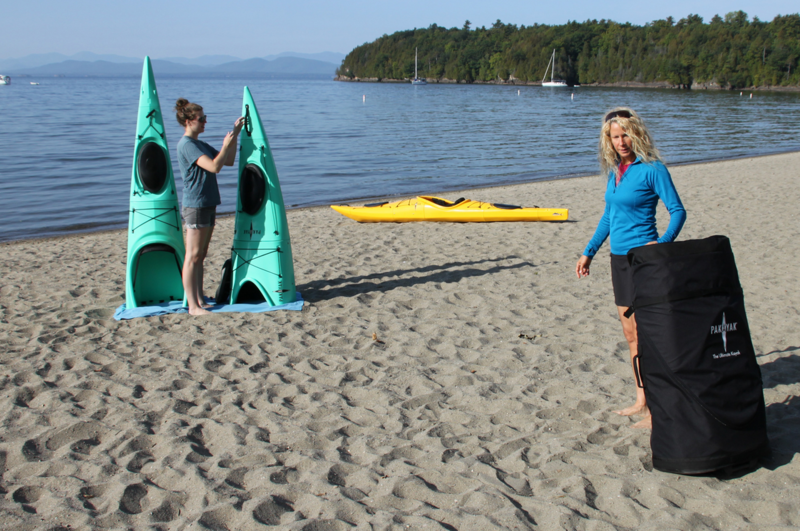 The world's first nesting performance kayak may not actually reduce to airplane carry on size. But its 6 interconnecting sections pack into a custom-made wheeled backpack bag that's a mere 3 feet long and weighs only 55 pounds. So you can store it in a closet. Then roll it like a piece of luggage and take it with you in a car trunk, a cab, train, ferry, check it on your flight, or even carry it on your back hiking to any body of water begging to be explored. 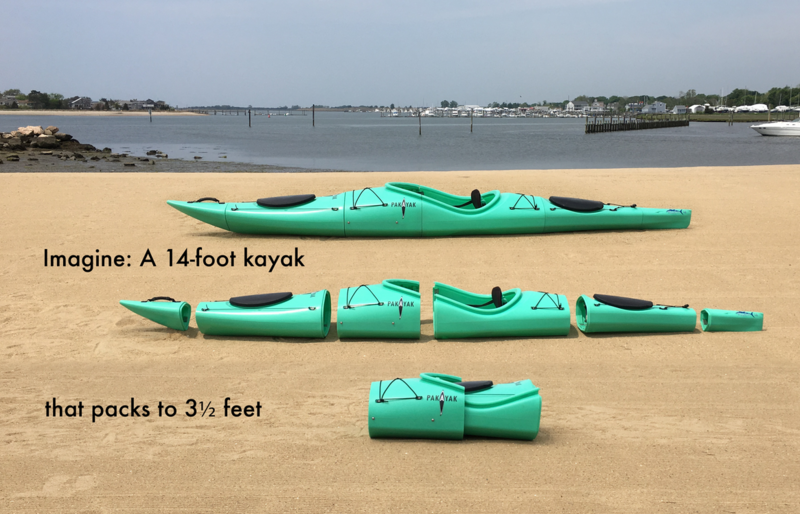 Once you reach the water, the Pakayak Bluefin 14-foot sea/touring kayak assembles in under 5 minutes – with no small, loose parts to lose in the sand. So even in a remote location anywhere in the world, you can create your own kayaking adventure. Pakayak is a crowd-funding, adventure-travel success story. A Connecticut outdoor adventurer / entrepreneur designed and patented the nesting Pakayak. The company raised 125% of its kickstarter fundraising goal, supported by lovers of the outdoors eager for a full-scale, easily-stored and easily-transported kayak. One supporter has pre-ordered one for each member of the family. The interconnecting sections are made from high-grade kayak industry resin that nest into each other, then assemble with a series of patented clamps and seals resulting in a watertight and rigid performance kayak. Once assembled, it looks and performs just like a conventional kayak. It has a thick foam seat for comfort, adjustable foot braces and seat back, two watertight hatches, watertight bulkheads fore and aft, a padded folding seat, adjustable foot braces, reflective safety lines, bungee deck rigging, front and rear carry handles, and it's rudder-ready. Future planned developments include additional models of different lengths, and seats for fishing, kids and dogs. Pakayaks aren't just the ultimate mobile kayaks. You can also feel good about the company's commitment to social and ecological responsibility. Clamps and shells are made in the U.S., where the kayaks are also molded and assembled, providing local jobs. Manufacturing, assembly and distribution all take place at the same facility to minimize environmental impact. The design reduces shipping and fuel costs compared to conventional kayaks. In fact, 6 times more Pakayaks than regular kayaks fit in a tractor-trailer. Pakayak takes seriously the responsibility of outdoor adventurers to be active stewards of the environment and puts their money where their mouth is. The first model, the Bluefin 14 is named after the endangered species, and future models will also be named after a threatened marine animal or fish, with a percentage of profit from each sale going towards efforts to protect that species and sustain the world's marine ecosystems. Pakayaks are inspiring and empowering. They have opened up a whole new way to travel the world with your own kayak and the complete freedom to spontaneously explore the rivers, seas and coastlines on your list. Regal Cruises and Travel will help you plan your trip to Connecticut.